Monday marks being home for a week and as sad as it is, this is the last time I'll be at home before starting my full time job. The holidays have been exciting and the prospect of a new year brings new ambitions and goals, along with additional weight which I'll have to lose before racing begins in February. Thursday evening began the first of 3 days of Christmas my family celebrates, including my dad's side, my family, and my mom's side. 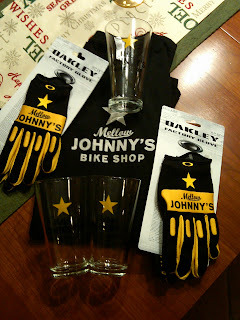 I was very excited when I opened some Mellow Johnny's swag including a few pint glasses and a long-sleeve tee. When I was home for Thanksgiving I ordered a couple sets of Oakley's Limited Edition MJ Pilot gloves that I really wanted and opened them at the same time, it seems I'll now be a walking billboard for MJ's. I also opened 3 pairs of MJ socks that my mom got for me to complete the billboard attire. 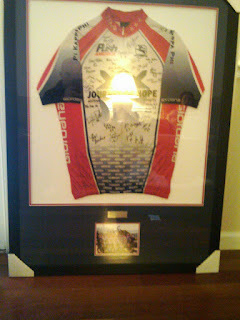 My parents were kind enough to get my jersey from this summers ride across the country framed with a photo of the team and silver engraving with Journey of Hope, Trans America, Summer 2009. It's a terrible cell phone picture with the glare but it is all I have right now. I haven't been on the bike at all since Wednesday when I got on for about an hour and didn't accomplish much other than 30 minutes at endurance pace and a 15 minute warm up and cool down. I'm excited to get up and head to the gym tomorrow, I am hoping to get a good run in since I haven't been running since the Turkey Trot. Other than that life has been pretty boring with some much needed rest and relaxation as well as catching up on sleep. Leave for NY on Tuesday, Stoked! 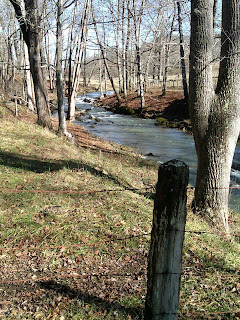 Posted by Unknown at 8:07 PM , Links to this post , 0 comments I'm reading from MyDailyGround: Happy Holidays Tweet this! 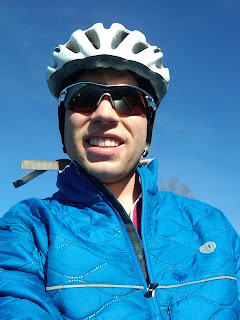 I completed my first "power based" workout this morning, a 2.5 hour endurance ride. The endurance zone is considered to be 69-75% of the functional threshold power, in my case this range is 137-146 watts. I continue to increase my time in the saddle but today had to take a few breaks during the ride to give my body (certain anatomical areas) a rest. Tonight I updated the firmware on my Garmin watch and hopefully will figure out whats causing inaccuracies in distance with the 310XT data, as today's data says I completed 60 miles in 2:15, not happening. Today's ride entailed a 15 minute warm-up at <56% of FTP or 109 watts followed by 2 hours of 69-75% of FTP and a 15 minute cool down at <56%. Unfortunately I had the ride cut short by a dentist appointment but managed to get 1:45 in of the 69-75% of FTP, totaling the ride at 2:15. I got off the bike a few times to refill my bottles and another time to stop for a restroom break, but when I got back the PowerTap didn't pick up the HRM and I had to search for it, which represent the two large missing sections of HR from the PT data. Today was also extremely busy but I managed to get to Spokes Etc. and pick up some Assos Chamois creme, amazing stuff. Tonight I cooked lamb for the first time, came out pretty well and will definitely be cooking it again maybe trying some different recipes. Posted by Unknown at 8:39 PM , Links to this post , 0 comments I'm reading from MyDailyGround: 2 Hour Endurance Ride Tweet this! I awoke early this morning around 5AM fighting a rash from carbon-fiber work at the shop last night. I flipped on the TV and while browsing infomercials I somehow found motivation to climb on the bike and complete the Functional Threshhold Power Test I've been wanting to perform. 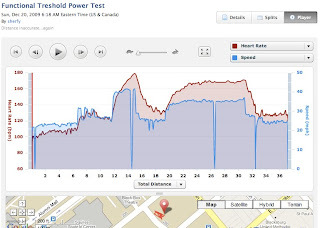 A test from which all training power outputs are based when training with a power meter. 2. 3 x 100+RPM - 1 minute intervals followed by 1 minute rest each. I wrote it all down on a sticky as its a lot to remember especially when my main focus was pedaling. I got ready; turned on my fans, hopped on the bike and started with the 20 minute warm up. To this point the longest ride on my trainer had been about 45 minutes, not very long at all considering this summer I spent 4-5 hours a day in the saddle. As of late (as if I've been doing it a lot), I've begun jammin' to Rage Against the Machine on Pandora during my time on the trainer. Rage is a little heavy for 6AM but it certainly gets me pumped up and keeps me focused or shall I say disctracted. My strategy during the time trial section of the test was to cover the time on my computer with the tape on my sticky note to pass the time faster. Even though the time was covered I based my time on the number of songs that played before I finally took a peek at 16:30. At one point I did try to cheat and lift up the sticky note to see the time but realized I had put the tape directly over the time which I think helped in the end. As far as my perceived effort, I think I probably could have gone harder but I'm just not sure. The cool thing about power is that this test is performed regularly (about every 5-6 weeks) to determine if any improvement in performance has been made. 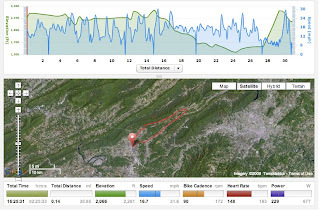 Below shows the data captured by the Garmin during the test. I'm not overly pleased with the recording of the 310XT and here's why. The graph below shows three dramatic pauses in speed which occur from not pedaling, which didn't happen until after the 20 minute interval when I got off to tell Pandora that DAMNIT YES I'M STILL LISTENING!!! I don't have a magnet mounted on my wheel for the Garmin speed sensor because CycleOps recommends not to due to possible interference with the power meter. So where is the speed data coming from? Beats me! Not to mention the speed is similar to that of a car, not a cyclist on a trainer. 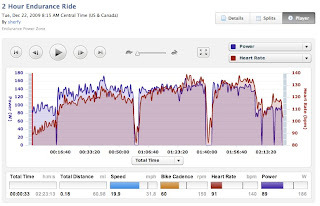 The PowerAgent ride summary shows all of the components of the ride. The 3x100+RPM - 1 minute intervals can be easily identified around minute 20. The result for the FTP 20 minute section, the important part of the test was 195 Functional Threshold watts. This number was corrected by subtracting 5% of the measured FT of 205. I still have a lot to learn but this ride was a start in the right direction and hopefully I'll begin workouts based on power here soon. Sesame seared Ahi Tuna on a fresh field greens salad with tomatoes from the vine, balsalmic dressing, freshly grated parmesan cheese, and other misc. ingredients. Posted by Unknown at 7:24 AM , Links to this post , 0 comments I'm reading from MyDailyGround: Training with Power Tweet this! Another luxury of not having classes other than being able to ride is the opportunity to cook dinner without concern of when I'm going to get around to HW. My goal has been to cook with something new every time I cook and while I haven't managed that exactly, I have broadened my horizons and learned some new dishes. Posted by Unknown at 3:03 PM , Links to this post , 1 comments I'm reading from MyDailyGround: Cooking 101 Tweet this! My one and only "final" if you want to call it that was last Wednesday night at 7PM, allowing me to relax over the past couple days and even have the opportunity to ride some. Christmas came early when my good friends Jeff and Jordan came down to the visit. They brought one of my Christmas presents that I convinced my mom into giving me early. For years I have been wanting an indoor trainer for several reasons primarily to train during the winter, but also to ride when weather doesn't allow and warm up properly before races. 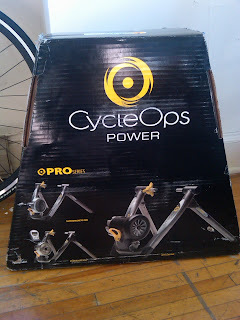 I've never had the money for the one I really wanted, a Cycleops Fluid Pro. CycleOps is an American company associated with Saris Bicycle Racks. I managed to get $105 dollars off the already very expensive trainer during a Black Friday Eastern Mountain Sports deal. I'm planning on writing a review on it once I have some more time to play with it and put some serious miles on it, so far it has been doing the job well. Last night I decided to give it a try and since I haven't had a chance to pick up any of the accessories for it yet (sweat mat and leveling/climbing block) I made a makeshift sweat mat and tire block to level the bike from a towel and textbook. My 6th edition Thermodynamics did quite nicely, however I need to find a box fan because the tower fan just isn't cutting it when it comes to ventilation. It's a good thing I made that space for the trainer when I did. While on the trainer I played around with using my Garmin 310XT to record my power data and compared the results to the PowerTap head unit results, they proved to be fairly similar except for distances (discussed later). Below shows the results of my first ride on the trainer and my first longer then 5 minute ride with the new power meter. The first output is from PowerAgent, CycleOps interface for downloading and dissecting power data from your rides. The learning curve of using a power meter effectively is steep and I have a ton to learn. 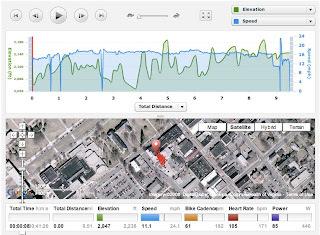 Below is an output from Garmin's online Training center, Garmin Connect, where my data is automatically uploaded using then ANT+ stick from my Garmin Forerunner 310XT. My distance is shown while stationary by the red line that travels all over my building and the parking lot outside. I did my ride by the window and forgot to turn off the GPS for the ride, and have now since setup multiple profiles for riding including one for outdoor riding and another for stationary/ indoor trainer riding. 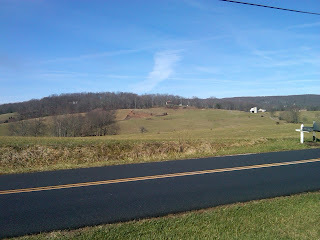 Monday was gorgeous with temperatures in the high 50's and I couldn't resist but go out for a ride and judging by the amount of cyclist I saw whilst out it seemed everyone else had the same idea (yeah! first opportunity to throw in whilst!). 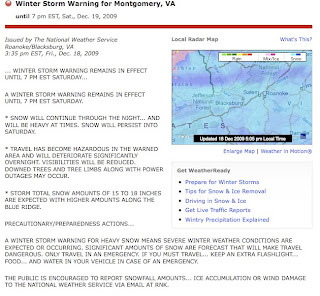 Weather like that in December is few and far between for Blacksburg especially considering the current blizzard outside of my window. 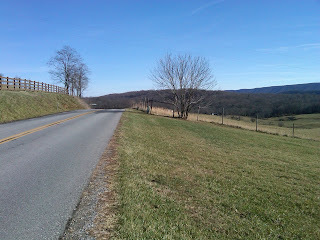 For the first outdoor ride with the power meter I choose a route that is a favorite for Wednesday Worlds around and also has gorgeous scenery and a narly climb at the end of the ride. The ride total was just around 31 miles and under 2 hours of actual ride time. I did not have autopause turned on which is another convenience of having two bike profiles on the Garmin. 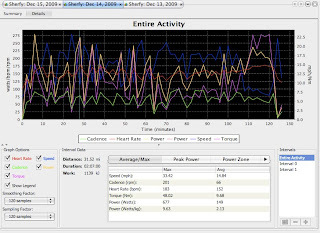 As for the power data I have absolutely no idea what it means at this point, nor what the sampling and smoothing factors affect, or how to interpret my performance from the ride. I've picked up two books about training, including Training and Racing with a Power Meter which will hopefully give me a better understanding of the data I'm looking at. 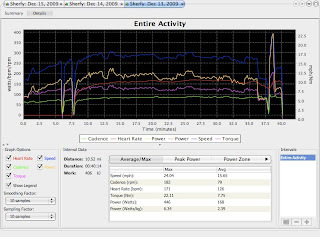 Below is power data from Tuesday's trainer ride, about the same distance but this time I have a very large error in my Garmin's distance with the GPS turned off so I'll have to look into that. As discussed earlier were supposed to be getting 18" of snow today and into tomorrow which means that outside riding isn't happening, not that it can't..just that there is not way I'm going out in it. The snow means fun times on the trainer and maybe a few movies from Redbox to keep me entertained until I can get home, because right now I'm not going anywhere. Posted by Unknown at 7:45 PM , Links to this post , 0 comments I'm reading from MyDailyGround: Semesters over....well sorta Tweet this! From one gear geek to another, I've decided to write up what I think are some of the best holiday suggestions for 2009 season. The holidays are always a stressful time trying to figure out what to get family members that special gift in a modest price budget. Here's 5 Gear Geek items for active family members. Perfect for those runs where an Ipod Touch or Ipod classic is too much on your arm. Simply clip it to your shirt or cycling jersey and forget It's even there. The only problem is since It's so small It's easy to lose. They make changing lenses a no brainer with hinged nose-bridges that swing away taking seconds to put new lens in. They also come in LiveSTRONG color scheme. The perfect gift for those who love to run but are concerned about the elements. Look sweet and will definitely be trying a pair soon hopefully. A new book documenting Lance's return to cycling from last fall to this years LiveSTRONG global summit in Dublin, Ireland. Perfect for that family member who always seems to have a camera handy and likes all of those close up images. Posted by Unknown at 7:20 AM , Links to this post , 1 comments I'm reading from MyDailyGround: Gear Geek Holiday Wish List Tweet this! Tonight marked the opening of the new Blacksburg Farmers Market, replacing the existing parking lot that transformed into a makeshift market on Wednesday afternoons and Saturday mornings. The new market sitting on the corner of Draper Rd. and Roanoke St. features a new structure with tables that allows vendors to set up their displays with access on both sides. Having the opportunity to view the construction progress out of my window daily It's nice to see the final product in use and the reassuring feeling that the annoying noise associated with the construction will be coming to a halt. I fell in love with this bicycle and took about 20 shots of it trying to get just the right one, it really fit the downtown scene and market atmosphere. Too perfect to pass up, and a darn good looking bike. Tonight was also the annual Blacksburg Holiday parade which drew an even larger crowd to the new farmers market and really made downtown the Happening place for the evening. Michelle and I met a very nice lady who stood with us during the parade. The small town feeling of a holiday parade is very special and something I hope to have when I'm settled down. The night was picture perfect and while my photography skills are amateur I'll post what I got in hopes of advice on how to get better results at night. Alirght this one was blurry on purpose, can you guess what it is? Temperatures were chilly and made hot chocolate an absolutely delightful dessert to a perfect evening with warm milk of course, the only real way to make hot chocolate. On a recent trip to NY Lance had several guest appearances including an interview on CNN about media scrutiny and the current Tiger Woods debacle. 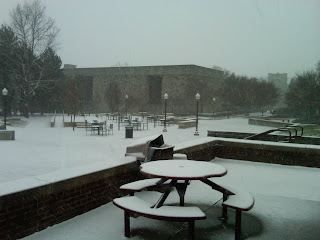 Posted by Unknown at 8:49 PM , Links to this post , 0 comments I'm reading from MyDailyGround: Christmas Parade and DT Blacksburg Tweet this!